This tutorial will show You how to use the data dissector to find interesting values and analyze data. Our task will be to find a few unit's structure, analyze them and find a "player ID" to create a god mode cheat. Start the game and play it a bit. If You have played Warcraft and similar games, this game will be familiar to You. This should be very easy, the health of a unit it displayed when it is selected. It is stored as a Float type value. Find some enemies, search for Your health and if You have found it (You should have only 1 result in Your list), add it to the table. Now You should have enough addresses to start analyzing a unit's structure. So what are structures? To keep it short, let's just say that some values are stored together in one place instead of scattered around in the memory (You can find many more info about structures on the Cheat Engine Forum). In our case, the most important data about a unit is stored together in a structure as You will see it in a minute. The start of the structure (the base address) is usually the register between the , which is in our case ESI. ESI+04 is the address of the health, so we can clearly see that the health is stored almost at the start of the structure. Ok, what kind of information can we find here? 1. Open the memory browser and use Tools->Dissect data/structures. 2. As we have 4 units to compare, use File->Add extra address to add 3 more address slots. 3. Now in the address slots, type in the address of ESI, which is in our case the health address-4 for all 4 units. 4. If it is done, use Structures->Define new structure. 5. You can give a name for the structure, but it is not important, click Ok.
6. 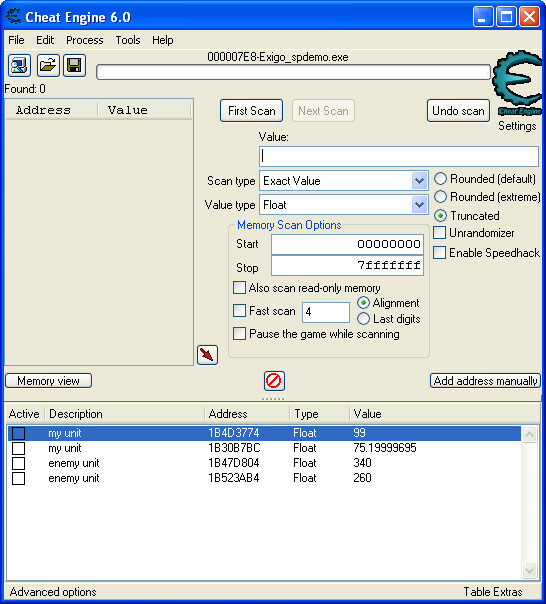 Click Yes and allow Cheat Engine to guess the type of the values automatically. It will do a very good job. 7. It is enough to analyze 4096 bytes now, so click on OK again. Now You see 4 coloumns with a bunch of data using red and green colors. Red means that the values in the structures are different, green means the values are perfectly matching in the structures for all 4 units. To make things even easier for us, we can even create groups. As we will try to analyze the differencies between friendly and enemy soldiers, let us put enemies in a different group. Right-click on the enemy unit's address and choose Change group. Set all enemy unit's group to 1. You can immediately see that some colors has changed and some values are shown with blue color. Blue color means that the value is the same inside that group, but it is different compared to other groups. Now we can go on with the analyzis. I told You this will be an easy game so You will immediately see the important values. 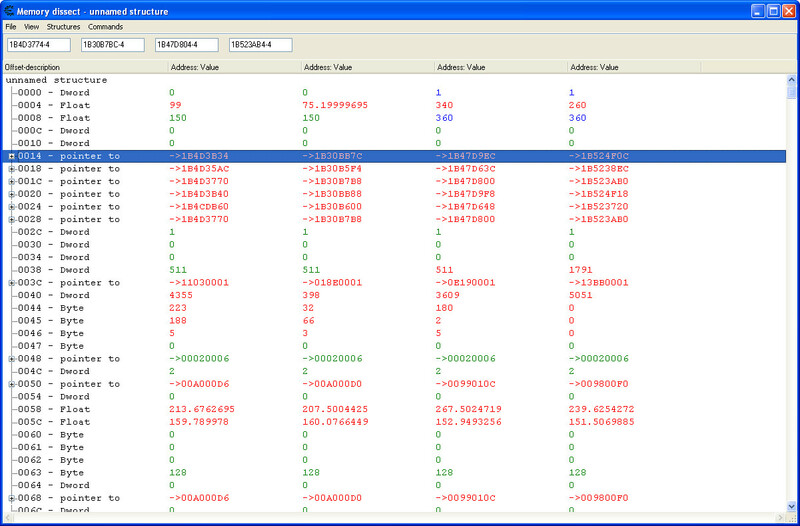 offset 0000 [ESI]: As You can see, the first value is 0 for friendly units and 1 for enemy units. Yes, You are right. This value is storing the owner of the unit. 0 is the human player so if this value is not 0, the unit is an enemy unit. offset 0004 [ESI+04]: We know that already, this is the health of the unit. offset 0008 [ESI+08]: If You have a sharp eye, You can probably see that this value is the maximum amount of health for the unit. offset 000C [ESI+0C]: Mana of the unit. offset 0010 [ESI+10]: Max mana of the unit. This info is already enough for us to make a god mode script and if You find the code which is changing the mana, You can easily create an infinite mana script too, which will work for Your units only. Now my test units don't have mana so 0C and 10 has 0 value. All we have to do now is write a script which is checking the value of ESI when the health would be changed and if it is 0, change the unit's health to maximum. Feel free to use code injection and try out the script, it will make Your units invincible. If You want, go for it and create an unlimited mana script too. It should be piece of cake now. Now You have seen a real example of how values are stored in structures. We have searched for the health only, but with the help of the data dissector, we have easily found the player ID, max health, mana and max mana too. And we could find even more, like attack speed, attack range, attack power, unit speed, unit rank, vision range, co-ordinates and many more. In FPS games, You can use the same method to compare Your player's structure to the enemies' structure. Find the health, armor, co-ordinates, gravity modifier, speed modifier and many more values that are related to Your charachter. Or find the ammo for Your weapons and compare Your weapons' structure. Find the ammo, max ammo, rate of fire, weapon range, and many more weapon related values. There is one last important information that You need to know. Structures are sometimes connected to other structures. Like tables in a database. It may happen that a unit's information is stored in 2 or more structures, not just in one. Usually structures are connected to each other with pointers, so in a structure, sometimes You may find pointers that are pointing to another structure which also holds further information that You may need. It is always useful to check out the pointers to see where are they pointing. They are the connection to some useful information. In RTS games, a pointer in the unit structure may point to the "player structure" which holds the amount of resources and other information about the player. Sometimes You can use this pointer as a player ID for the unit if You have found a way to connect both structures. In FPS games, a pointer may point to the name of the charachter, usually to "Player" or similar string, and You can use this string to compare and create a god mode. If You check a weapon structure, usually You find a pointer which is pointing to the charachter's structure, this way You can create unlimited ammo for weapons that are pointing to Your charachter's structure only. In summary, You need to realize that data and structures are connected to each other by pointers. Be creative, patient, vigilant and You can figure out where are these connections and how to use them to Your advantage. That's the end of it, I hope You will find interesting values whatever You are searching for in whatever game. For now, I think I will play a bit with Armies of Exigo, keep experimenting with any game that You like.